On a glorious September afternoon we were delighted that Her Royal Highness The Princess Royal, joined us to celebrate our 50th Anniversary. HRH was met by Asst. Lord Lieutenant Mr Michael Fetherston- Dilke, The Chairman of Warwick District Council Councillor Stephen Cross and Councillor Mrs Christine Cross, Des and Rosemary Wells, Proprietors of our venue, Home Farm and Anona White, RDA West Mercia Regional Chair, who introduced RDA Warwickshire County Chair, Rosie Fetherston-Dilke and our Group Chair, Donna Jenkins. As part of the visit some of our riders gave two short demonstrations watched by guests made up of its Founder, Mrs Beryl Sainsbury and some of our financial sponsors, past volunteers, suppliers, riders family and friends. The riders were delighted to be presented commemorative rosettes by Her Royal Highness and there were lots of smiles all round. 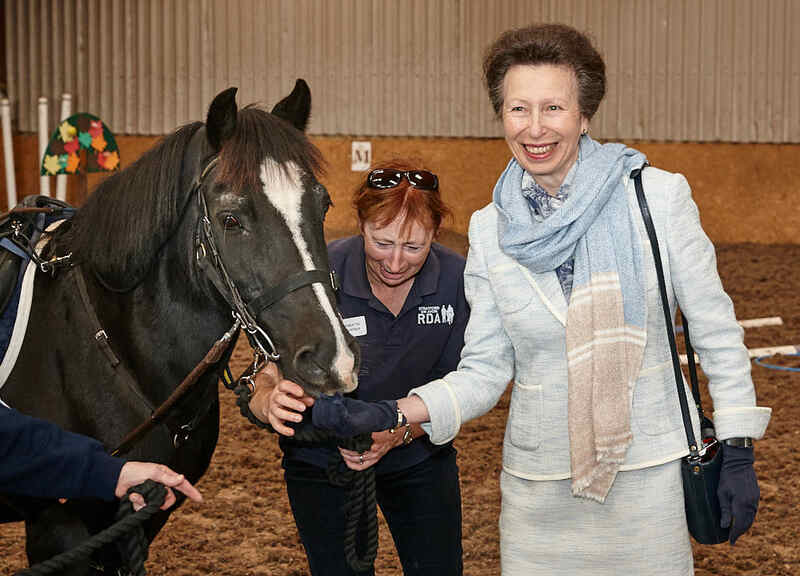 The Princess Royal was also invited to watch a demonstration by Anna, our Rider Representative, to show how the new lift operates to enable access to our new classroom. The classroom has very recently been installed to provide facilities for its riders to gather for stable management classes, pre-lesson exercise and a warm waiting area. HRH was introduced to the companies who had helped financially and practically in the installation of this project and was also shown an exhibition of available RDA awards for riders and volunteers and photographs portraying our 50 years helped by our retired Coach, Pat Gallard and Diana Reed and Lady Dunne, our retired volunteers. Her Royal Highness thanked some of our long standing donors and sponsors and our hard working volunteers. The afternoon was concluded by a presentation by HRH of a variety of awards. Long service awards were given to our ponies, Marco and Keira, with Marco providing one of the highlights of the afternoon by attempting to eat his award, which brought much laughter from HRH and our guests. After retrieving the award from Marco’s mouth, HRH presented the Silver Jubilee award for 25 years service to volunteer, Beryl Tomlinson and the award for 30 years of volunteering to Sally Johnson. RDA Over and Above awards were presented to Jill Nelhams, Karen Arnold and Jasmine Wyatt for their outstanding contribution to RDA. The final presentation was for a new award donated by its founder, Mrs Beryl Sainsbury, now in her 97th year. The Beryl Sainsbury Special Achievement award which was given to Max Stainton, who commenced riding with the Group at the age of 5 and this year became the first man with cerebral palsy to ride to Base Camp Everest on horseback, raising over £60k for RDA UK. A special vote of thanks was given to Beryl for her commitment to the Group and HRH unveiled our commemorative plaque and cut the cake. Our youngest rider, Billy then very proudly gave HRH a posy and we concluded the afternoon with tea and cakes. Many people have helped the Group with its continued success. We owe a huge debt of thanks to all who have volunteered their time and provided generous financial support and donations to help keep our riders provided with the fun and therapy that they all enjoy. What a perfect way to celebrate our 50th year! Previous post: 50th Anniversary Gala Ball enjoyed by all!